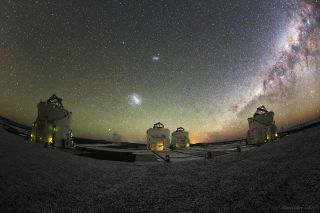 A view from the Very Large Telescope array in Chile shows four auxiliary telescopes under the Large and Small Magellanic clouds and the Milky Way. Miguel Claro is a professional photographer, author and science communicator based in Lisbon, Portugal, who creates spectacular images of the night sky. As a European Southern Observatory photo ambassador, a member of The World At Night and the official astrophotographer of the Dark Sky Alqueva Reserve, he specializes in astronomical skyscapes that connect Earth and the night sky. Join Miguel here as he takes us through his photograph "Magellanic Clouds, Auxiliary Telescopes and the Milky Way." Captured from the platform of the European Southern Observatory's (ESO) Very Large Telescope, located on Cerro Paranal in the Atacama Desert of northern Chile, this image shows four moveable, 1.8-meter auxiliary telescopes operating under a starry sky. According to ESO, the VLT is the world’s most advanced optical instrument. It consists of four unit telescopes with main mirrors that are 8.2 meters (27 feet) in diameter; these telescopes are generally used separately but can also work together to achieve very high angular resolution. VLT's four optical telescopes are known as Antu, Kueyen, Melipal and Yepun, all named using words for astronomical objects in the Mapuche language. Each of these instruments contains optical elements that can combine all four into an astronomical interferometer, which is used to resolve small objects. The interferometer is complemented by four moveable, auxiliary telescopes of 1.8-m (8 feet) aperture. For this single shot I used a Canon EOS 6D DSLR camera set to capture a 40-second exposure with the ISO set to 5000, and a 8-15mm fisheye lens, set to 14-millimeter at f/4. To see more of Claro's amazing astrophotography, visit his website at www.miguelclaro.com. Follow us @Spacedotcom, Facebook and Google+. Original article on Space.com.